Portobello mushrooms are a great substitute for meat in burgers. The problem, though, is sometimes the large caps can be a pain in the you know what to eat. To make enjoying your dinner easier, we've made a few changes with this portobello mushroom burger recipe. Top with your favorite fixings, including blue cheese and pickles, and you have yourself a delicious dinner! As a vegetarian, I love portobello mushroom burgers. However, I quit ordering them when eating out because I find the large caps so difficult to eat. Rather than giving up on this meal altogether, I started making them at home in a slightly different way. Cutting the mushroom caps into much smaller pieces makes them easier to eat, and cooking with onions bumps up the flavor. Placed between two toasted buns and topped with some blue cheese, pickles and a few other toppings and dinner is done — and delicious. Coat the bottom of a large skillet pan with olive oil and heat over medium heat. Add the onions and cook until just barely soft and translucent. Stir occasionally so the onions don't burn. Add the mushrooms and spices and continue to stir and cook until the mushrooms are soft. Add more olive oil if needed after adding the mushrooms. 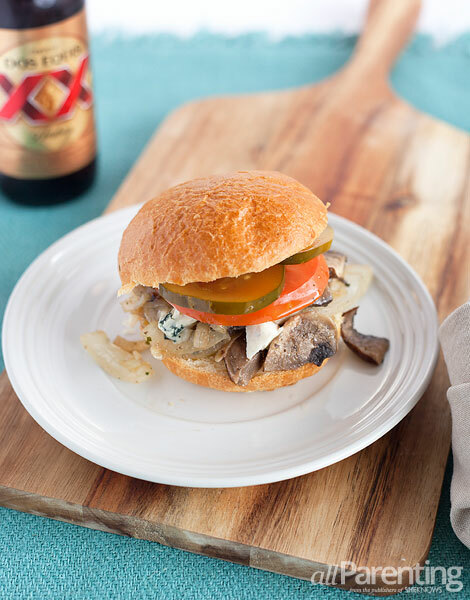 Serve the portobello mushroom mix on toasted hamburger buns and top with your favorite hamburger toppings (try blue cheese, stone ground mustard and pickles). Enjoy!